I try not to buy too much in the way of seeds and other sundries for the garden if I can help it at the moment. I prefer to swap or save if I can but I always end up buying a few things and and sometimes it's good to introduce new lines to what I'm growing. Suttons had an email offer the other day of their autumn planting garlic and shallots set, reduced from £25 to £10. I bought it on a whim, which is unusual for me, but when it turned up I wasn't disappointed. 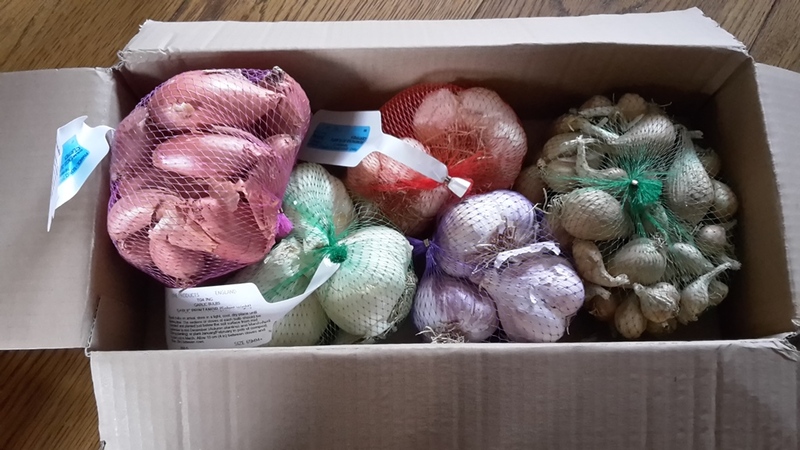 There was three lots of garlic, one bag had two bulbs in and the other two had three bulbs, then the two types of shallots weighed in at 500g each. A good amount of alliums to plant! I managed to get the garlic planted today and hopefully I'll get the shallots in tomorrow. With those three new types of garlic and my own saved from this year (as well as the elephant garlic) I'm going to have a couple of beds full (with the shallots as well) and that's before I've planted any onions in the spring! They are a little steady, but these turned up really quick. It's funny as so many companies can ship things around the world in a few day you think they'd be better organised. I already have my red 'baron' onions for planting in the spring. I've never had much luck with garlic, out here they keep telling me that it all depends on the moon. But what when and how they never say. I've given up with red onions for now as they always seem to bolt. shame as I much prefer them. As for planting with the moon, I'm not sure I buy into all that myself. Wow, what a bargain! I love alliums but I find weeding onion beds the biggest chore - even planted a hoe's width apart I manage to behead more than I actually grow! I hate it as well, This year the onion beds were not looking their finest. But when weeded I think they look the best in the garden! After complaining that we haven't had enough rain earlier I am now waiting for it to be dry enough to plant my aliums! I also have some early peas and broad beans to plant now, so I am getting a little frustrated. I'm having a go with some overwintering red onions this year. My ground is wet but I've just gone for it. The bed is a little raised up so should eb a bit of drainage. Sales are the way to go. I need to get my elephant in now as well. I had a great year with garlic so I'm planting four times as much this autumn. Fingers crossed! I've doubled mine this year, I plan on pickling some as well to help it last longer. We're having a week of higher than normal temperatures, which makes me think I ought to plant some too; it's as if i'm being given a second chance. Go for it. It's the one veg that can alter the most meals I always think! I was inspired and bought one bulb to plant. I will buy more when I find what I want, but this will give a dozen or so starts. It's a good start, to be honest it depends how much you use. I always end up putting in about 6 cloves in most meals so we never have enough!